If you have been following my exploits (and I think you’d better have a darned good excuse if you haven’t been), then you know that I recently went to the small animal clinic at Texas A&M University (TAMU) in College Station, Texas to have some abscesses removed. Just to refresh your memory, Melly blogged about it here. 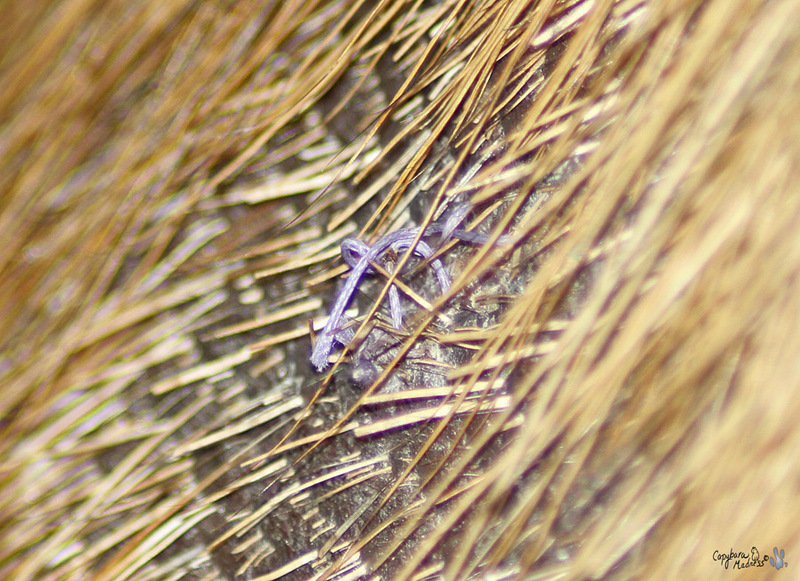 After ten days, I was supposed to have my stitches taken out. 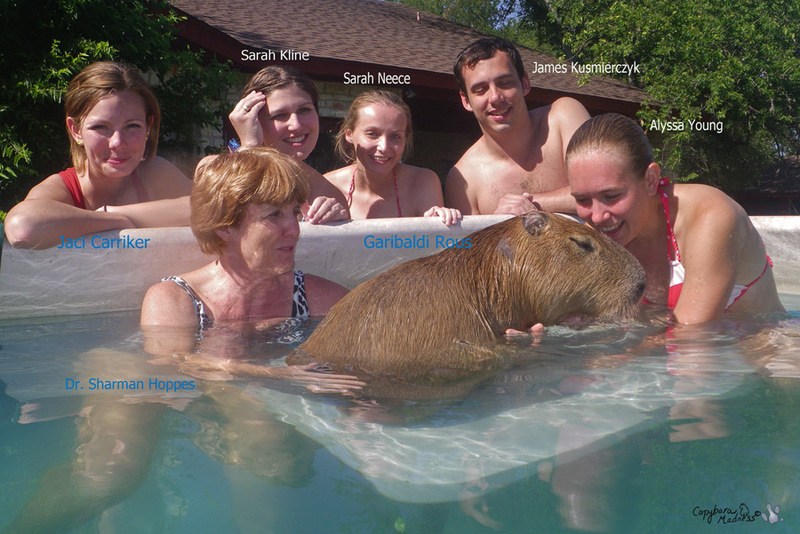 Considering how stressful the drive was for me and the fact that Dr. Hoppes and her team had to come to Austin to take care of a zoo lion anyway, we all decided a house call was in order. 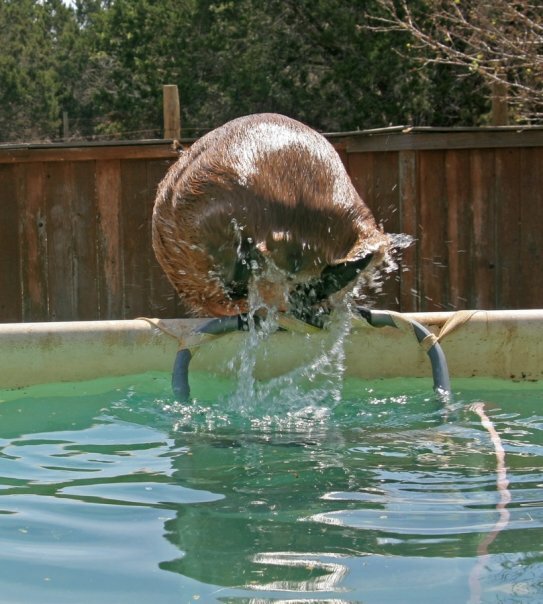 Normally I don’t like to give Melly any credit but I have to admit that it was her idea to remove the stitches in the pool. After my visit with Stacy Winnick and Angela Mitchell, she said that I was calmer in the water with strangers than I am on land. We started out with just me, Melly, Dr. Hoppes and one student. Melly thought some would have to get out so others could get in but I was so calm and well-mannered that gradually she just let them all get in. Outside of the vet clinic, Dr. Hoppes isn’t half as scary. It didn’t even hurt when she took out my stitches. In fact, I was too busy eating blueberries to notice. Dr. James K. was about my favorite of all of the vet students. 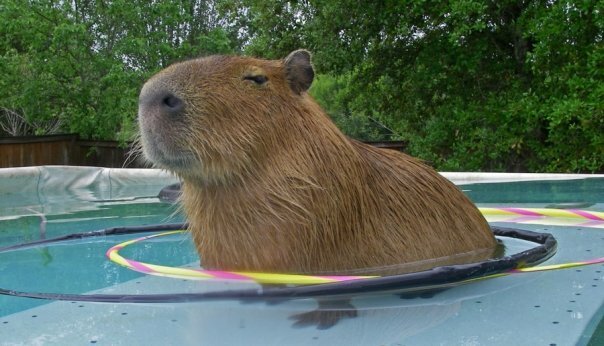 Melly says I shouldn’t play favorites but what’s a capybara to do? Sometimes you just have that personal attraction. Everyone wanted to have their photo taken with me and this worked to my advantage. I’m not saying I took advantage of them, I’m just saying I photograph best when I am eating something sweet, in this case blueberries. They are my new favorite food. Melly had to literally stuff one in my mouth to celebrate Caplin Day on July 10th but I am so glad she did! Feed me and I'll love you! Jaci wasn’t even in the pool when she fed me some blueberries. It was about 100 degrees outside though so she soon decided to join us in the water. 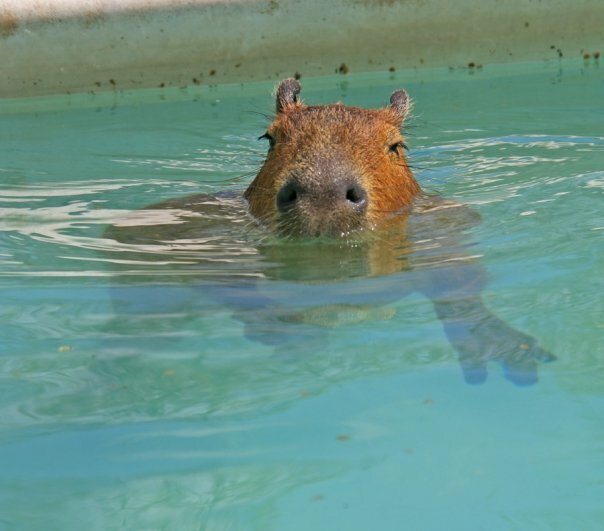 It’s an amazing thing about water but something we capybaras are very aware of, no matter how hot it is outside, it is always cool when you’re in the water. 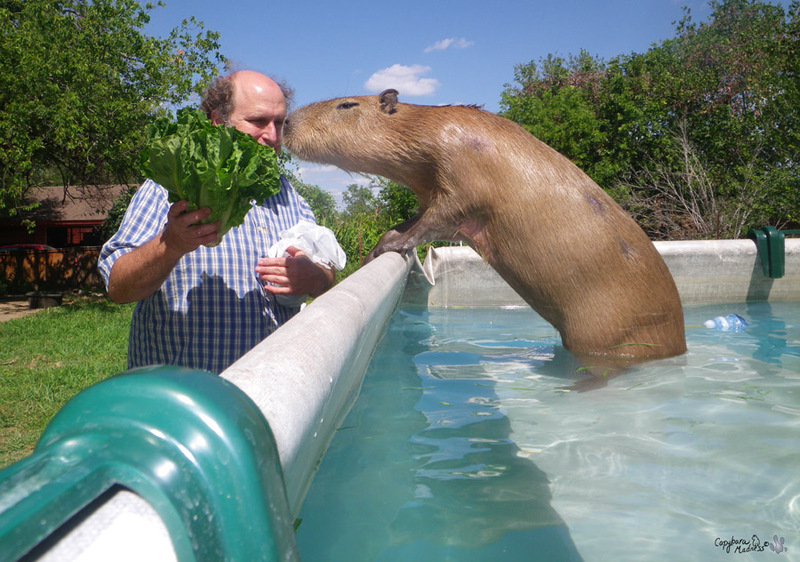 After a while, Rick showed up with a big head of lettuce. That was a good thing too! 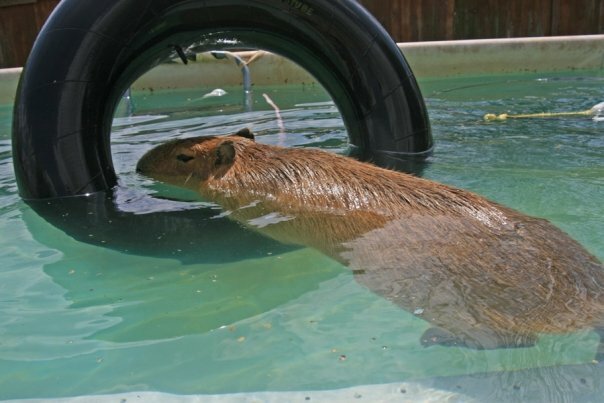 I love the blueberries but how many would it take to fill this capybara-sized stomach? More than one little box, I’ll tell you that. 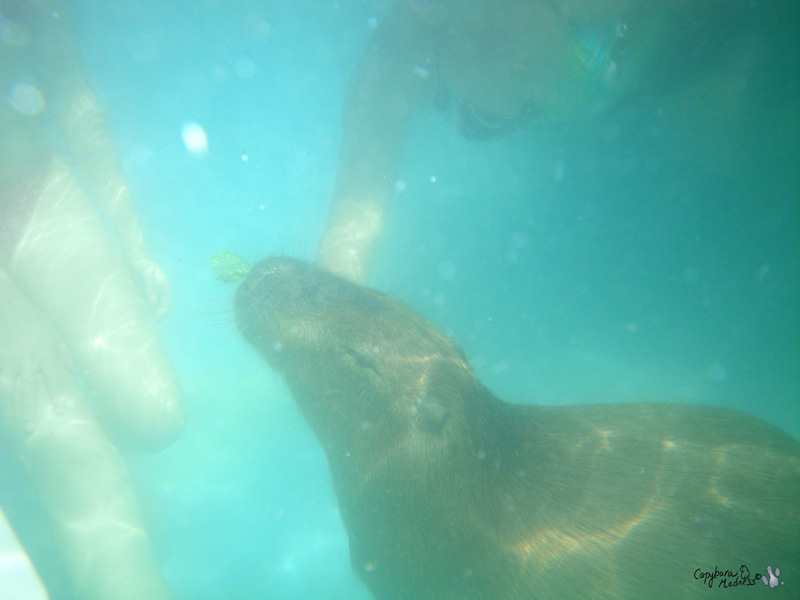 I was so happy to see that lettuce that I almost jumped out of the pool. 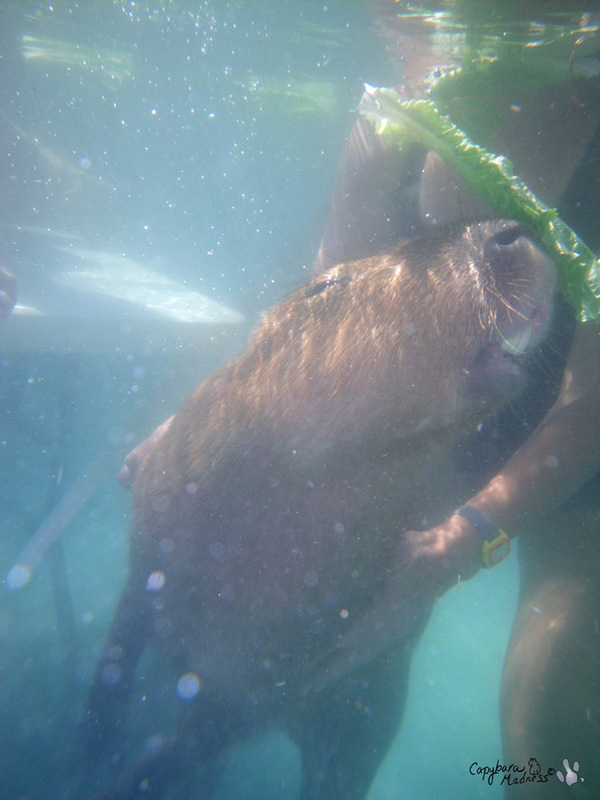 Lately Melly’s been making me catch my own lettuce underwater. I don’t know why she thinks that is a good idea but especially when there are so many people around. We are lucky that no one’s femural artery got chomped, not that I’d do it on purpose. Don’t I have lovely teeth? Why aren’t people more afraid of them? Don’t they know what kind of damage my teeth could do? I suppose the vet students must, right? Why weren’t they afraid? 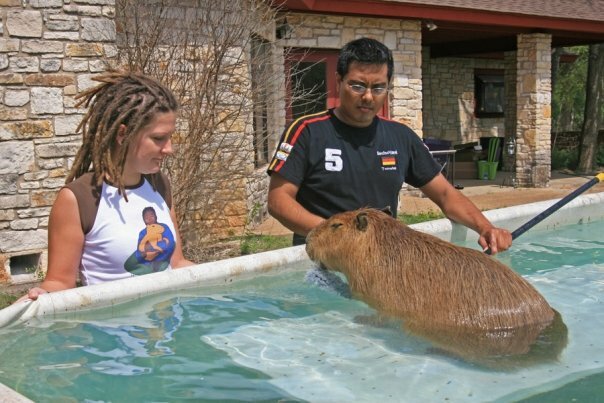 These people know you can never trust a wild animal like me, so why do they seem so trusting? And why didn’t I do anything about it. You can see I was just putty in their hands — or arms. 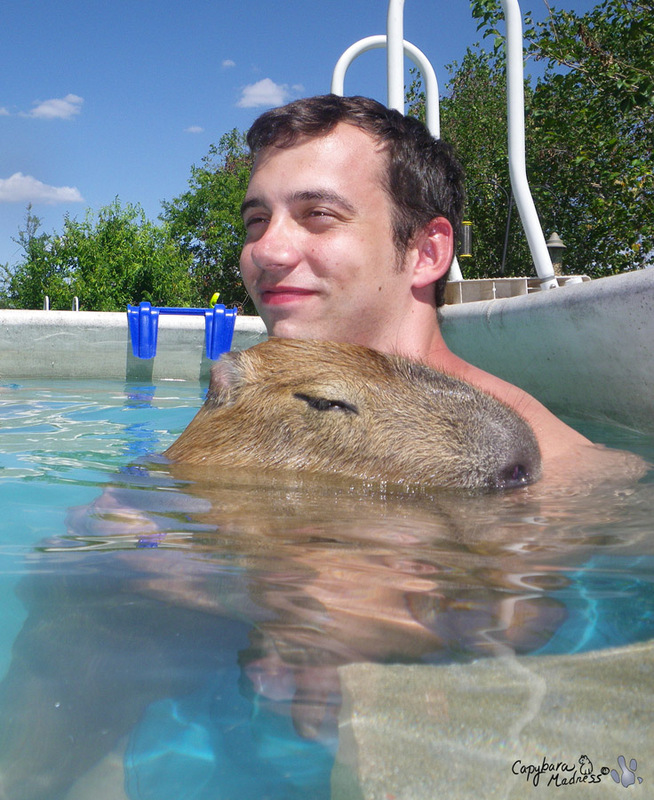 All that swimming and good food made me a little sleepy, capys can sleep in the water you know. I did have to show Dr. Hoppes some of my cute moves. 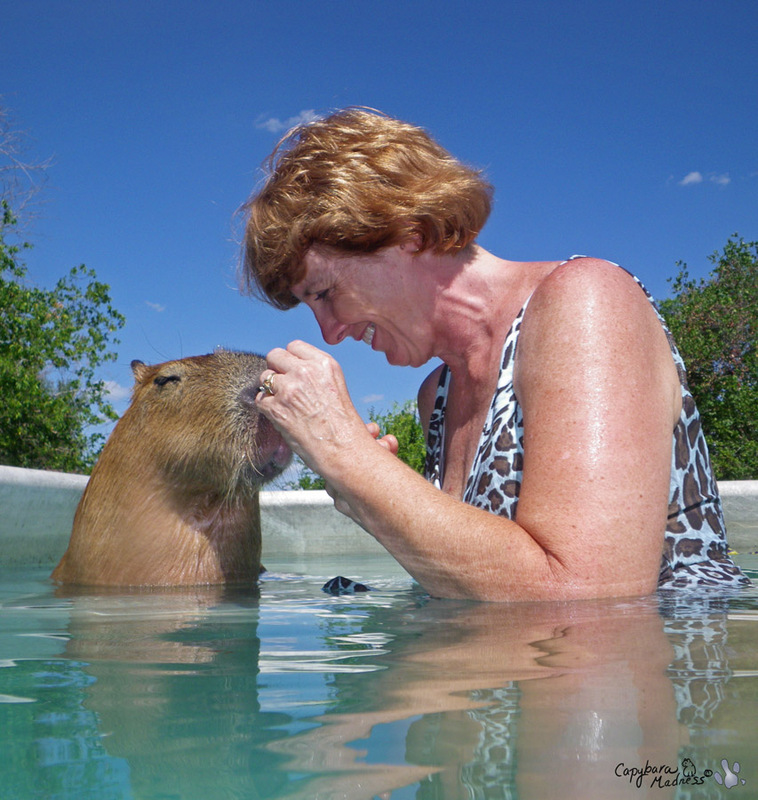 Right before Melly took the photo above, I was resting quietly in Dr. Hoppes’ arms and then, as sudden as the changing mind of a capybara, I threw myself over backwards. 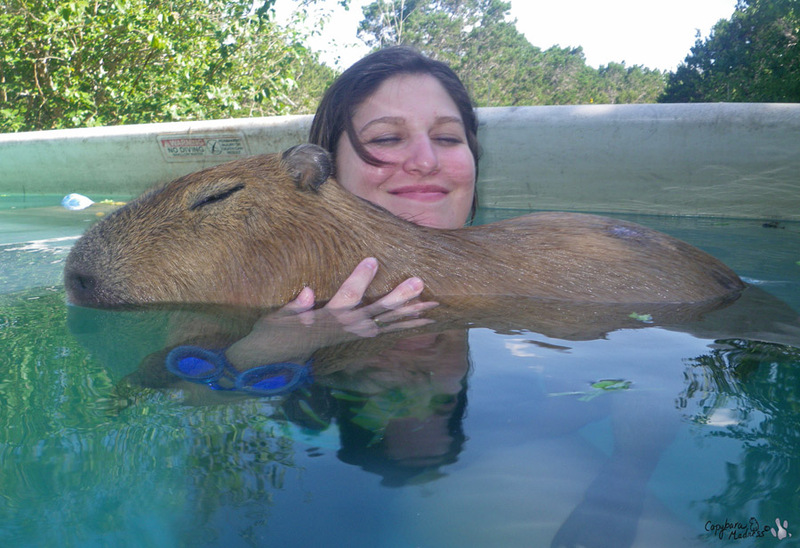 That should teach her how unpredictable we capybaras can be. Too soon — let’s say 1.5 hours later — it was time for the vet crew to pack up for the trip home. 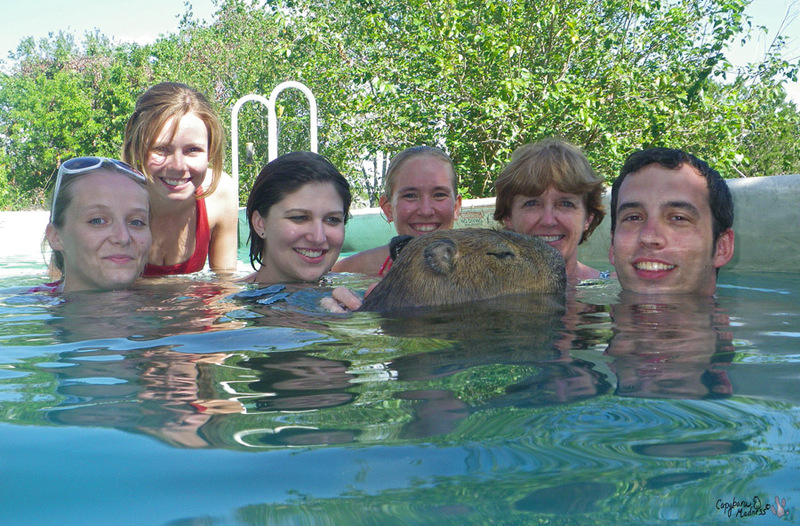 They were all great swimming partners and I will miss them. That isn’t to say that I want to go visit them at the vet school though! Wow! What an adventure! I loved this post and the great photos! 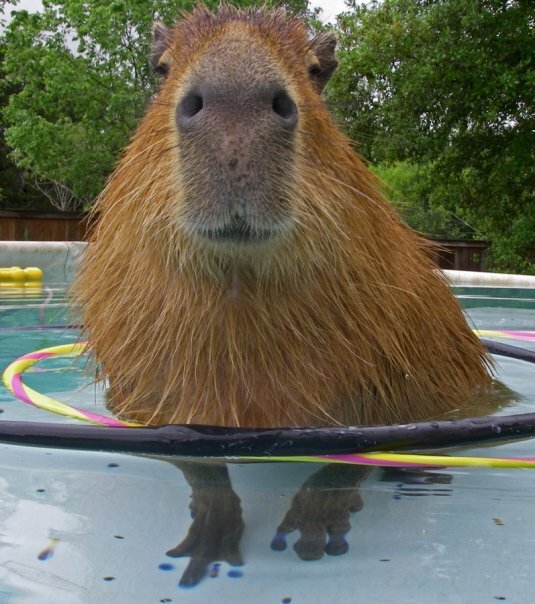 You are one lucky Capy! You iz a vurry speshal capi to gets a howse call Gari. Wat a frendly good capi you wuz too, you deserved efurry single blueberry an moar! Best blog post ever! Everyone loves Garibara! Hi. Glad you’re okay. Enjoyed your story. Looks like a great time. Funny too, cuz it’s supposed to be a dr. visit. Wow, that’s cool. Gari! 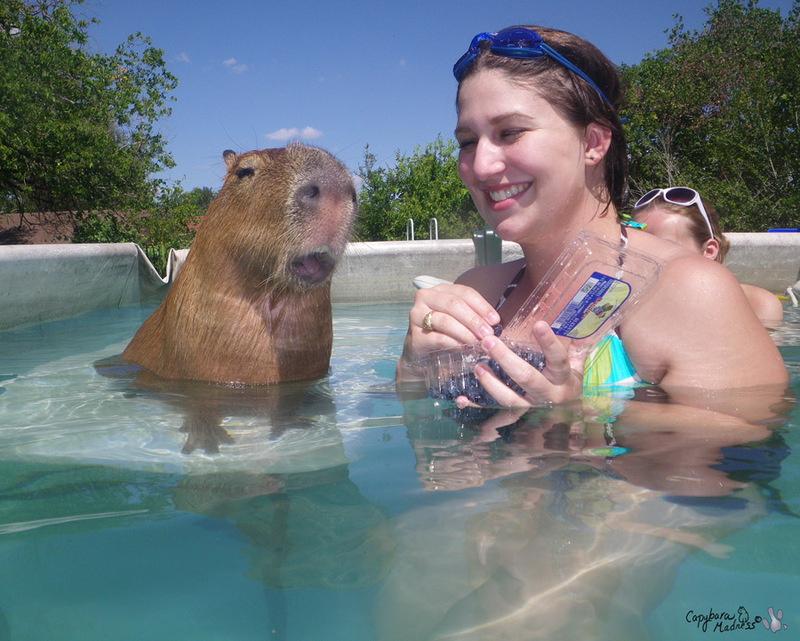 You’re getting to be quite a ham with people in that water with you! Love the pictures. And I bet that all of those doctors loved swimming with you. I bet that is an experiance they will never forget. What a great way to speak out for the ROUS Foundation. You go, Gari! Speaking of your sharp, ferocious teeth Gari…we had a rogue dog roaming our neighborhood that growled at my little girl, gwenivere. She said she bet you could take that dog on and win!!! I think she’s right. It’s because you’re too adorable for us to be scared of those teeth! Great blog post! Stay healthy now, please! 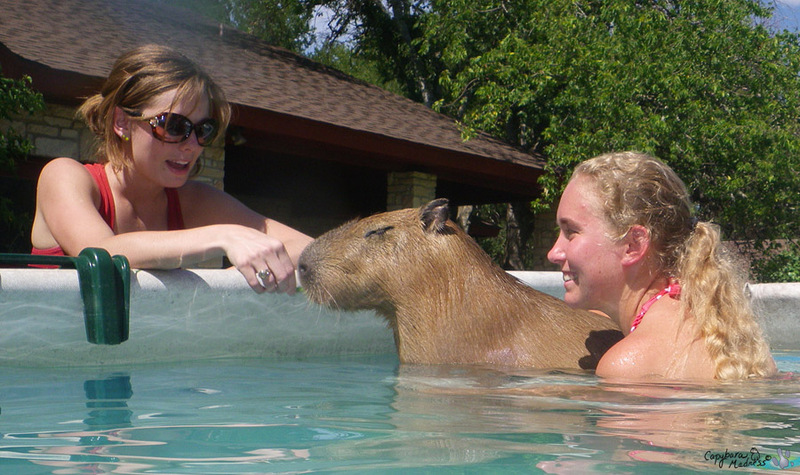 Garibara is turning into a first class Capybara Ambassador! Nice show, Gari! 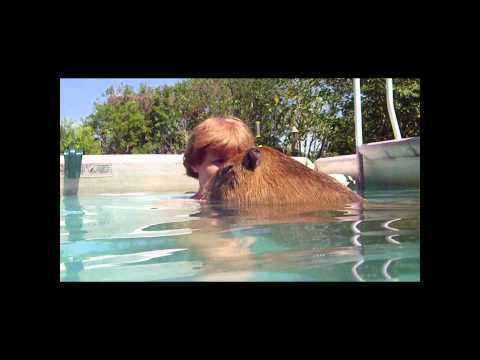 Nobody swims with me because they are afraid of my fish. And the 50 degree green water. But I am going to try blueberries again tomorrow! I never liked them before, but I might be missing out on something good! This post and pictures made my morning. You are Super Gari! This is Gari’s best blog ever! I am increasingly amazed at how advanced his vocabulary is! 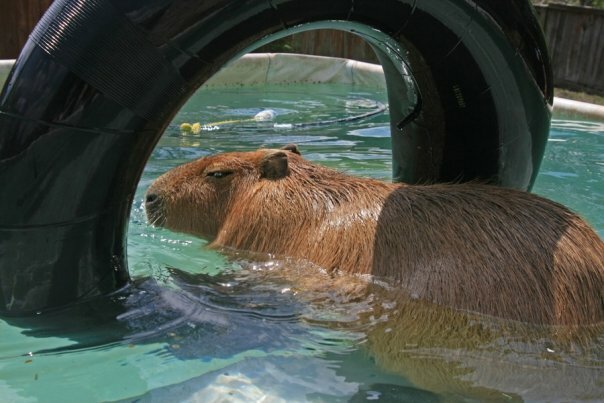 How many capybaras know the words “femural artery” and “alliteration”? Amazing!!! Not only is Gari cute, he’s intelligent too! 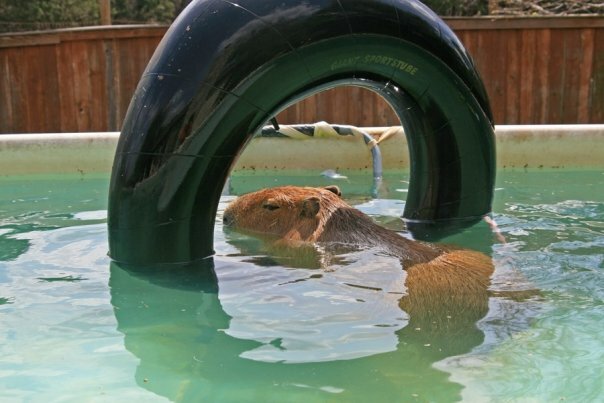 And Melly, what a great idea to have his stitches removed underwater.